If you’ve been paying attention to the news lately, you’ve probably heard about the protests taking place in Thailand. In fact, most of the news I’ve been getting on the story is the same as what you’ve probably been reading. Despite some more indepth coverage in the local English language papers, I really haven’t seen any indication of the troubles you hear about in the news. The only direct effect it had on me was delaying my flight by one day when I came from Penang to Phuket. In Phuket, one of the guys at the hostel and I went out on purpose to go find protesters. What we saw was pretty disappointing. We were hoping for angry people waving their fists shouting slogans. Instead, we found a small group of people sitting around listening to speeches piped in from Bangkok. 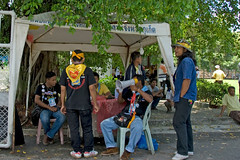 Most of the Phuket protesters had gone to Bangkok that morning we had later learned. The protests seem mostly motivated by a small group of PAD (People’s Alliance for Democracy) activists. Supposedly, the protests are against the corruption of the former Prime Minister Samak Sundaravej who is accused of being a puppet of the former Prime Minister Thaksin Shinawatra, who is one of the richest men in Thailand. Samak was ousted by the Supreme Court because he hosted a cooking show on TV. Thaksin was ousted by a military coup. The current PM is an inlaw of Thaksin. The PAD protests, at least on the surface, look like many of the people’s movement protests you saw in the 80’s in the Philippines. The difference here is they are protesting against a democratically elected government. The PAD is an urban party and the PPP (People’s Power Party) is more rural. I don’t know how much the protests are a legitimate expression against corruption (which almost never happens anywhere) or just sour grapes over not being the party in power. I’m secretly hoping for another military coup or some sort of huge protest to take place while I’m here. It might not be good for Thai democracy, but it would be exciting for me.